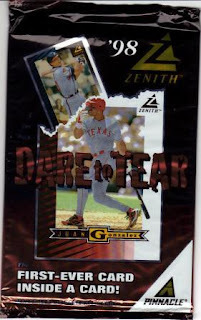 Things Done To Cards: 1998 Pinnacle Dare to Tear - Really, I dare ya! Nice! How many did you buy? 2008 A&G did a decent job hiding some parallel mini cards inside rare "Rip" cards that included a little paper zip line like you see on (some) ice cream containers. 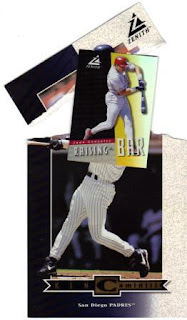 (I got one serial #'d to 99 that contained an alternate pose of another player.) This Pinnacle set looks like hard-core, say-goodbye-to-the-big card tearin! as always... if you find any Braves... I'll indian leg wrestle dayf for them. Turns out that I found DUPLICATES of Braves (I'll post the results of the box break on pack-a-day at some point), so I'll shoot them to both of you. And, Dayf, I won't bend the crap out of these like the Willis card!